Sometimes they’re tired, sometimes the mobile reception is bad and sometimes they’ve just had enough…. 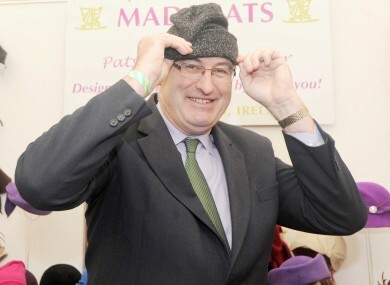 Phil Hogan tries on a hat at the Ploughing Championships in Wexford today. THIS MORNING ENVIRONMENT Minister Phil Hogan caused a bit of a stir when he hung up during a radio interview with a local station in Kilkenny. Hogan was responding to claims that he discriminated against a Traveller family who were supposed to be moving to an area in his constituency. The full story on that is here. I am at the Ploughing Championships now and I have engagements here so thank you for giving me the opportunity to clarify my position. It is not the first time that a current government minister has hung-up on a local radio station. Hat tip to Susan Daly and Gerard Cunningham. If we’ve missed any let us know in the comments section below. Email “Videos: Phil Hogan and 3 other people who hung up while being interviewed ”. Feedback on “Videos: Phil Hogan and 3 other people who hung up while being interviewed ”.